Do you have some buttons lying around? Does your child love dressing up and playing pretend? Then today's super easy kids jewelry craft is right up your alley! We recently visited a really cool store called Art From Scrap and had a blast rummaging through bins of random odds and ends. A couple of particularly lovely buttons caught my eye, and I knew that I had to take them home to make these cute button rings. This would a super fun craft to make for, or with young children. Chuck helped me to string on the buttons and cut the pipe cleaners. At the end his favorite ring was the red one. Why? It's the fire fighting one. Apparently it squirts water at fires. Who knew? Ooh. I just realized something else. This would also be a great craft for kids who love the Fancy Nancy Series too. Let's Make Some Button Rings! 1. Choose your prettiest buttons. Then, find pipe cleaner colors that match. Cut the pipe cleaners in half. 2. String your pipe cleaner through the back of your button. 3. Wrap the pipe cleaner around your finger and then twist both ends together. Use your scissors to trim off excess ends. These were so fast to make, you can quickly make yourself a whole set! Ahh! Love how each one is colorful and unique. Looking for other easy and fun kids jewelry crafts? 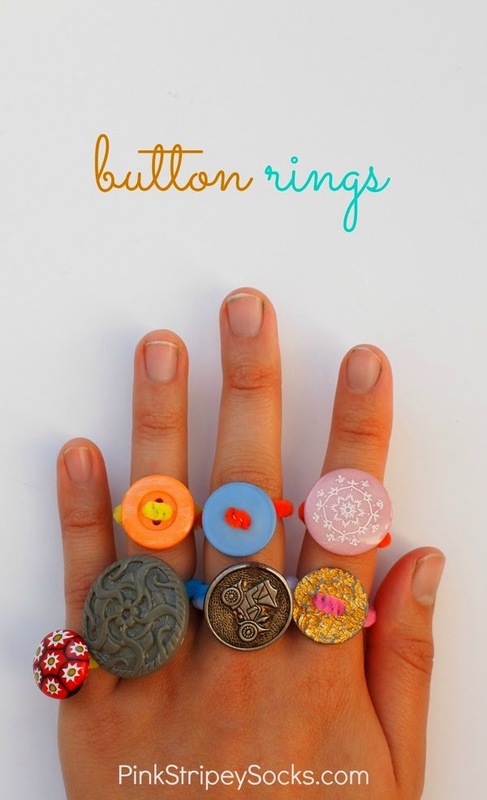 Check out these jewelry crafts for kids of all ages below! And remember, you can always find other fun ideas on my Pinterest, Facebook, Instagram, or Twitter accounts! Or, you could always sign up for my weekly newsletter in the pink bar above!